I'm an American traveling internationally and on my way back we'll have a long overnight stopover in Paris. We're arriving late at night and departing 5pm the next day. My wife is a designer and hugely interested in architecture and art, but we'll have our 2 year old daughter, so extended museum walks (I'm looking at you, louvre) are probably a no go. What sightseeing options are amenable for taking a 2 year old on a one day layover in Paris? If the weather is nice, skip going into the buildings. Spend the time walking near the Seine starting at Notre Dame. Eat lunch at a sidewalk cafe. Sit in a park. You will get more of a feel for Paris, and see more architecture, doing that in a leisurely, relaxed fashion than dashing to museums. With that amount of time, including eating and getting to the airport on time, you'll probably only be able to see one thing. I'm hardly an expert on Paris, but the Musée d'Orsay is both much smaller than the Louvre, and excellent. There are many different kinds of things to see there (not just paintings) which might keep a 2 year old interested for longer than paintings alone might. In general terms, to get around take surface buses if you can (rather than the metro). The metro is good for going from place to place, but you hardly get to see anything. Assuming it's not raining I would stay outside; if you are OK with skipping places like the Eiffel tower, La Concorde, etc. Then I would recommend sightseeing the Quartier Latin, roughly between the Pantheon and Nôtre-Dame. For example if you start at the Pantheon (if you arrived at the Charles de Gaulles airport, leave the train at Port-Royal, it's on the same line; same applies to Orly), you can go toward the Jardin du Luxembourg, it's a big Park with the Palais du Luxembourg (home of the Sénat) inside it. Usually there are nice exposition of pictures all around the park. From there, you can walk toward La Sorbonne then end up at Notre Dame. Also, around the Panthéon there are old streets with restaurants and bars. Here is a rough estimate of what you would have to walk on Google Maps. You won't have to walk that much while still seeing lots of historical places, packed with old/nice architecture, and you'll probably see some art shows on the way. As has been said, it's best to skip indoor visits as it takes the longest time to get into any of the museums and you don't have much time. Now, if the weather allows it, there's a pretty good itinerary you could take that shows you around many of the most popular monuments of the city. That's if you don't mind walking a lot. Otherwise you can do just the parts you're most interested in and explore the neighborhood. 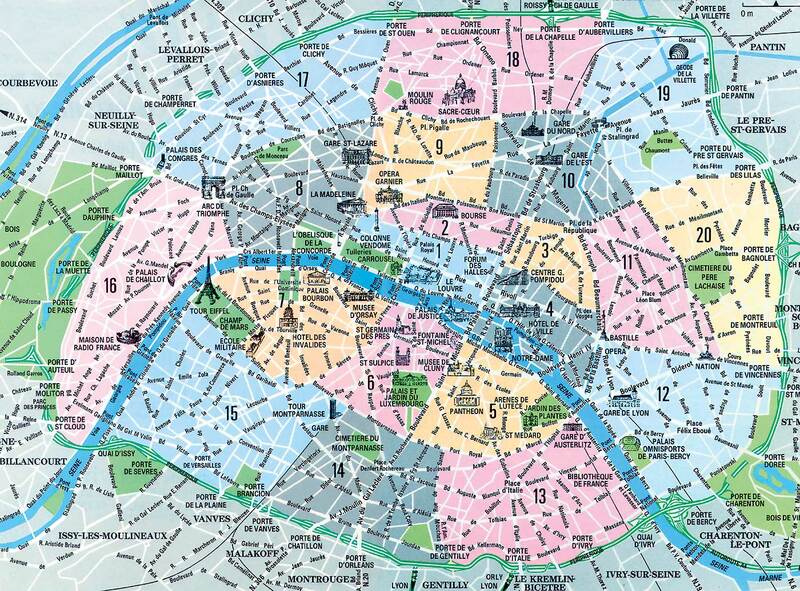 It starts at the Eiffel Tower, then goes on to the Arc de Triomphe which is nearby (you can also take the subway). From there, it's a straight line to the Concorde and you get to walk the Champs Elysées. You might want to take the subway again for one station to skip part of it. Then you arrive at the Tuileries, where you can start following the Seine as you pass by some other famous landmarks up to the Louvre. You could get as far as Notre-Dame and St-Michel, but you would have to walk fast. If you prefer to take it easy, there's a nice park at the Tuileries where you can take a rest. If you look at a map, you'll see it's almost a straight line. Some things to be aware of: since this is all very touristy, it is hard to find a good restaurant along the way (or it won't be cheap), so I would just grab some sandwiches. Also, it can be hard to find bathrooms in the city so if you do find one, don't waste the opportunity! And finally, I highly recommend buying some subway tickets in advance. They're not very expensive if you stay inside the city and will always be handy. Not the answer you're looking for? Browse other questions tagged layovers sightseeing paris children or ask your own question.